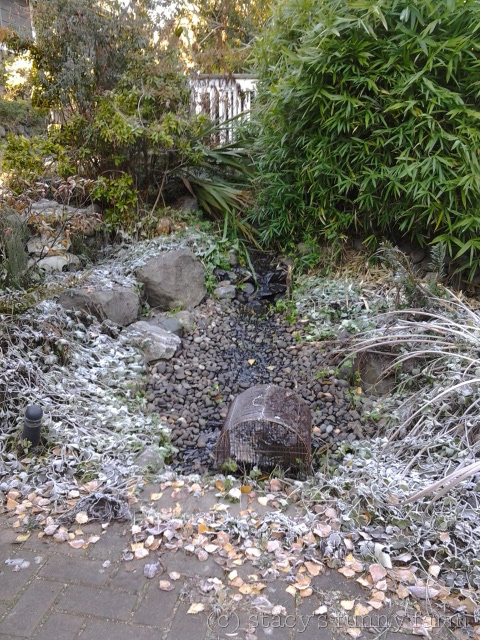 This month, we decided to skip Autumn and proceed directly to winter. 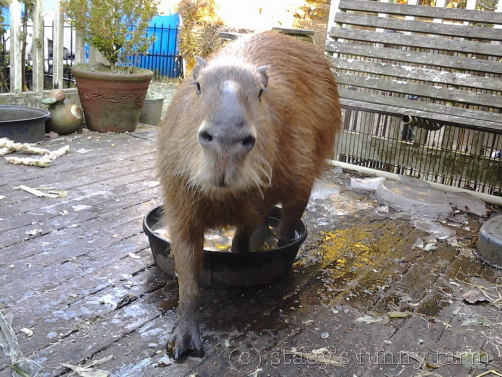 I winterized Dobby’s swimming pool pump, brought in his rattoon- a small clump of tender sugar cane- and watched the overnight temperatures dive to 22 degrees (f). This allowed me to finally make the determination that Dobby’s heater was dying, and so even though he has a heated kennel pad, I set him up for a slumber party in the kitchen. Who wants to sleep outside under crunchy frozen blankets, anyway? Well, Dobby does. A creature of habit, he feels safer sleeping in his pen with the raccoons and owls locked out. At 5 years old, he has slept inside on enough frigid nights to understand about winter, and he spends *most* of the night indoors. When morning comes, I usually discover that he has gone outdoors. The kitchen birds had to make some adjustments, too. I put a heater in their space and covered their cages, just in case some fool left the door open on his way out to his pen. 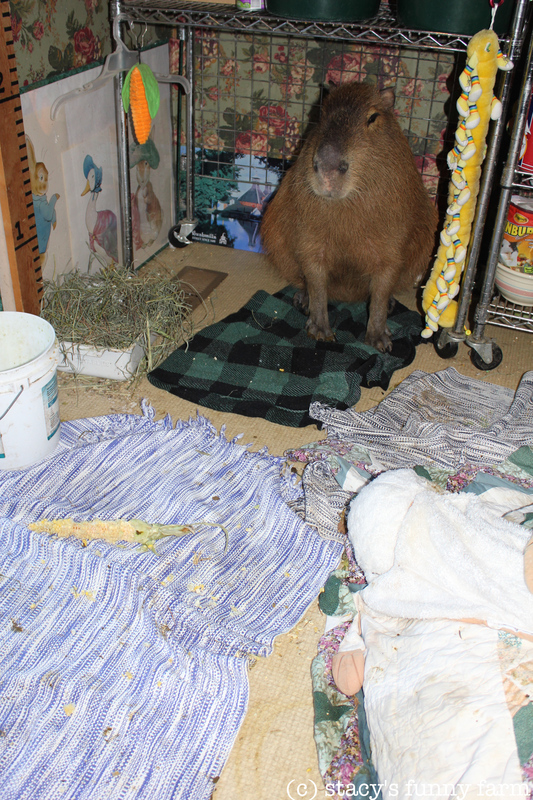 They also didn’t get their evening play/fly time, and missed a cage cleaning that generally has to happen at night, when “the help” is penned up. 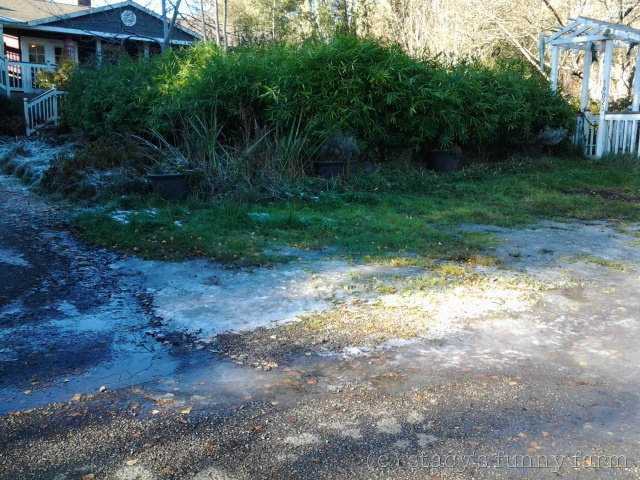 The parking area in front oozes groundwater that flows across the driveway and then turns to ice. The creek is spring fed, and ran continuously, even in 20 degree weather. It was wet and cold at the same time, but the sky was clear and the stars at night were startling. 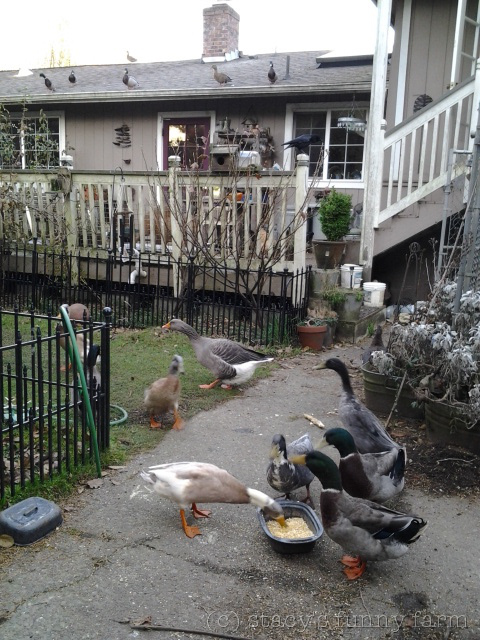 The ducks kept their pond from freezing by swimming all night. It’s warmer to swim in 33 degree water than to sleep on 20 degree frozen ground. In the photo below, you can see Dobby’s frozen swimming pool. The ice is over 3″ thick. Dobby moved around the back yard during the day to make the most of every ray of sunlight that popped through the tall trees to the South. Here’s Grover, doing the same thing. You might be able to make out Kitty Hawk’s white chest and paws on the ground and Madonna looking for bugsicles. Dobby has several wading pools in the back yard, but they freeze up faster than his swimming pool, and break when you try to chip out the ice. 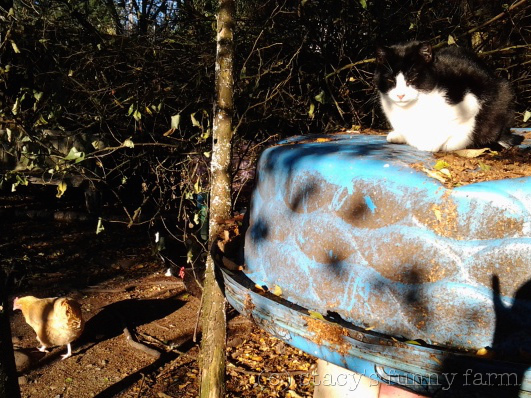 Once I discovered that new wading pools aren’t available in the winter (D’oh!) 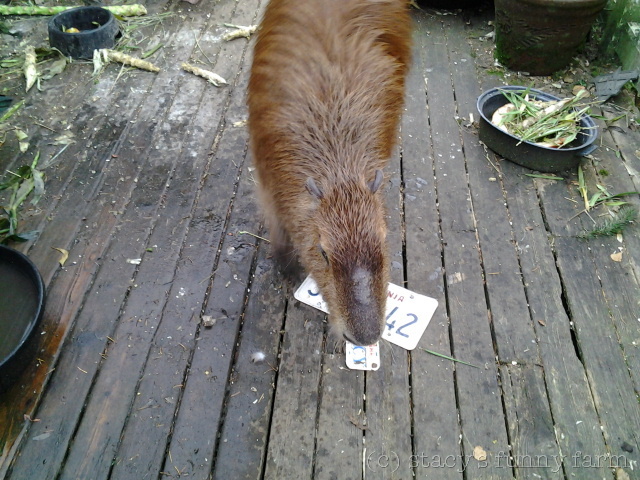 I became very respectful of them. (In that photo above, Grover is on a stack of them, stored upside down.) That’s when we put Dobby’s old potty bowl to use. Note the ice chunks behind Dobby. 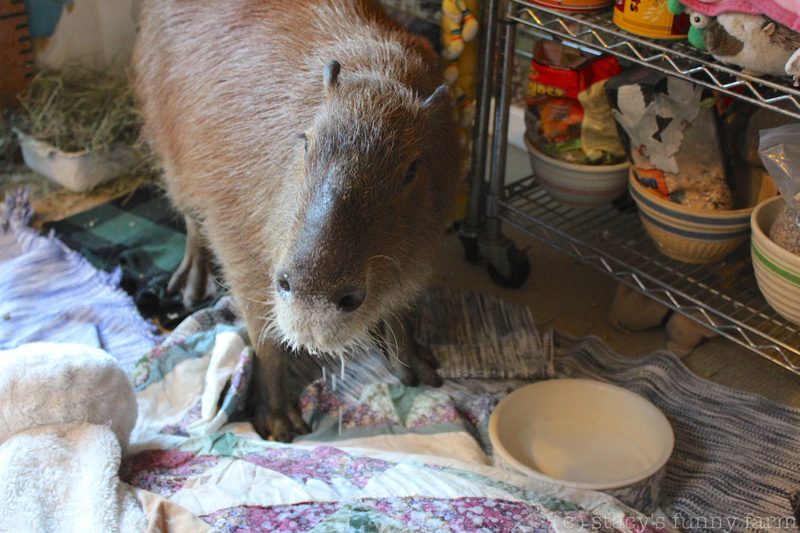 The little black rubber feed dishes we all use for baby capybara potty bowls are sturdy, bite-resistant, and flexible enough so that you can chip ice out of them without destroying them. Dobby loves to sit in one of these bowls and have me pour warm water over him. With the deep freeze lasting a week, one challenge was stashing the ice chunks out of the way where they don’t refreeze and become a bigger hazard tomorrow. It is also frustrating to discover the hoarfrost has expanded to block the gates from opening. As the daily temperatures crept above freezing, I chipped, raked, and cleared ice from the gate swing area. Oddly, the water table is so high this year that there is a permanent swamp- that never froze- just inside the gate to the barn. It’s not very conveniently located. It is an upwelling, so digging won’t make it go away. Maybe I need to build a bridge over it. 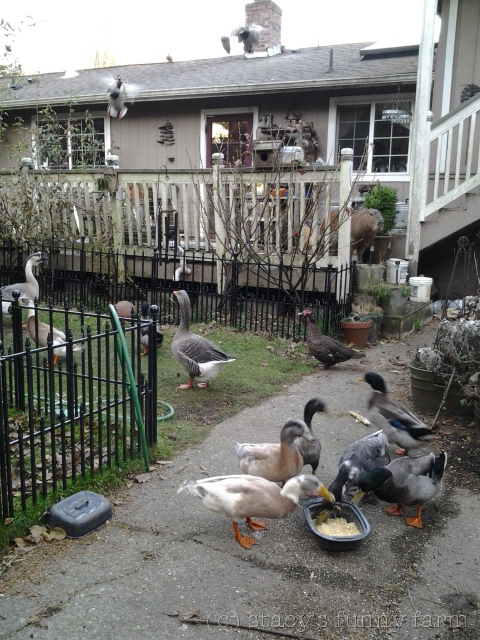 Dobby peeks from the deck as the freeloaders fly off the roof to check out the snack. The work never ends at the Funny Farm. While I am saving up for all new decks and railings, I am patching the rotten places with old license plates, a la Ma and Pa Kettle. Dobby insisted upon helping, but he isn’t very good with a hammer. He also isn’t very good at going away when I need to hammer something. Move your big fuzzy brown face, Dobby! 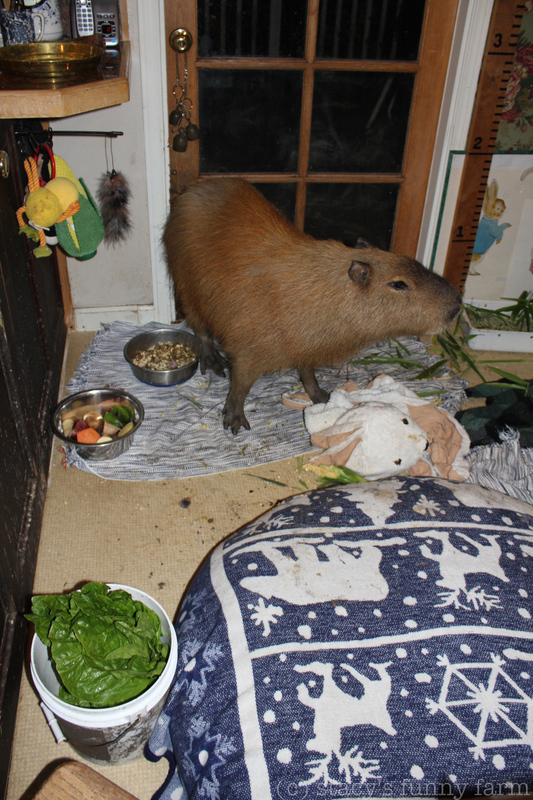 Meanwhile, the kitchen was getting grubby and sticky and gritty. I really can’t clean with him in there, and then, what’s the point? Eventually, I made the mistake of briefly leaving the barrier gate open to retrieve a bowl, and Guess Who slipped in the door at that very moment? For those of you who think I am cruel not to let Dobby into my home beyond his special kitchen area, I present the following photo. 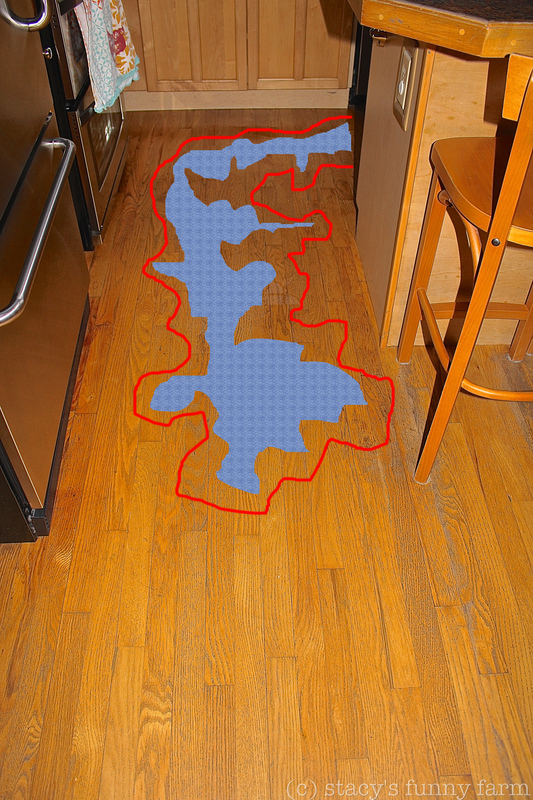 The puddle of urine he quickly created as he pranced into the kitchen didn’t show up in the photograph, so I created this visual aid. The only reason the puddle stopped here is because I convinced him to turn around and go back. 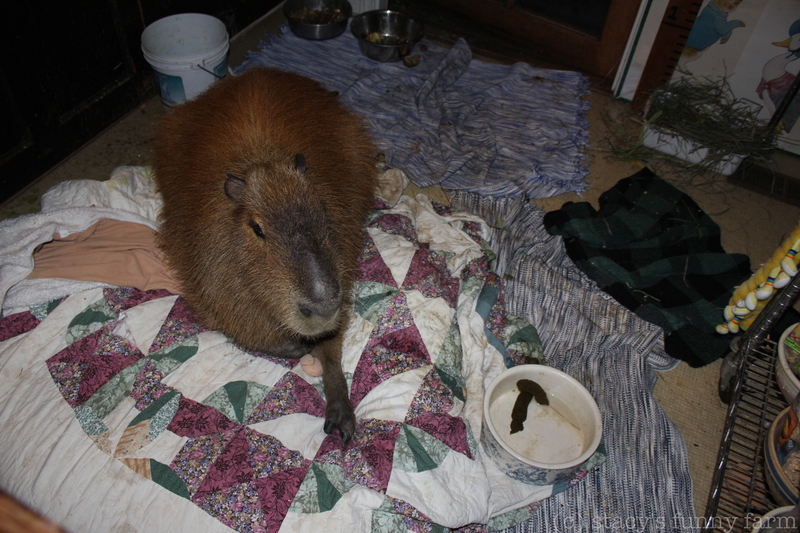 Those of you who own capybaras will be very impressed that I was able to do that without a cattle prod. Dobby is adorable, but if he wants something, his quick temper turns him into a wild animal. Meanwhile, the temperature hovered around 20-22 degrees every morning. For a week. Dobby slept inside, the birds got covered, and the kitchen got grittier and stickier. There sure are a lot of grubby blankets in there. 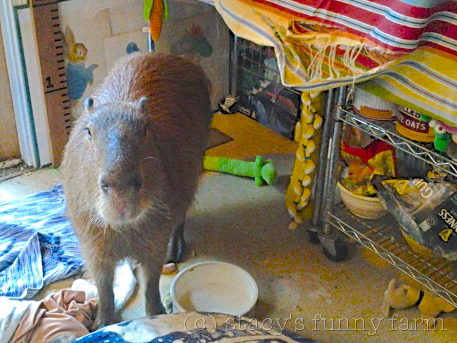 Dobby always has his breakfast milk indoors in this bowl, but his dinner milk was indoors in this bowl, too. 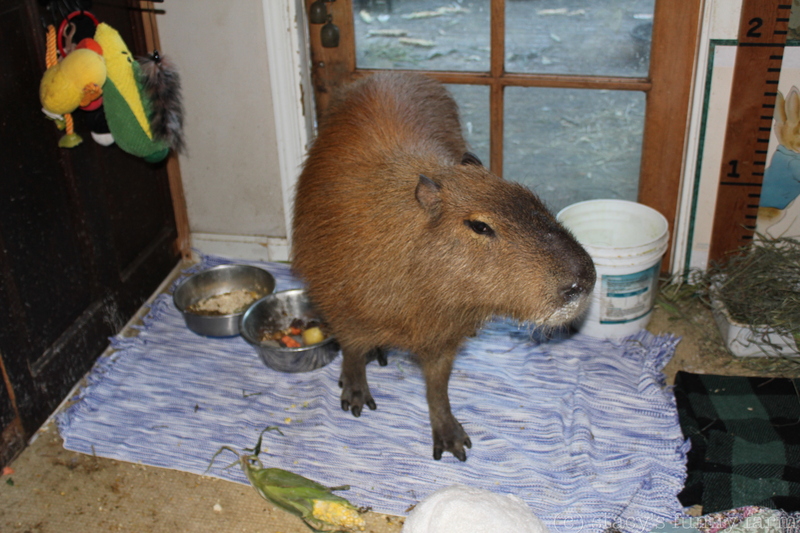 Corn is really sticky, but it was now an indoor treat, too. Milk and corn together, day after day. I probably need to clean the walls, too. And then, there are the pouffy moments. I used to think it was so cute to see him all puffed up like a porcupine, but when he’s in the kitchen, it usually means he has created a masterpiece. Oh, NO, Dobby! Not in the kitchen again! Dobby is a lot more mellow than he used to be. 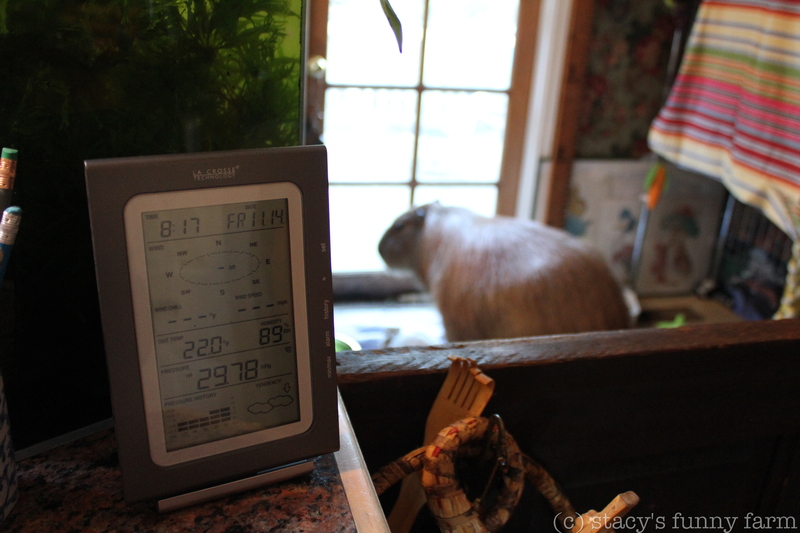 In cold weather, he’s resigned to sitting out the day indoors, by his heat vent in the kitchen. Even so, eight days was a long time. In the fall. We aren’t anywhere near official “winter” yet. Meanwhile, check this out. 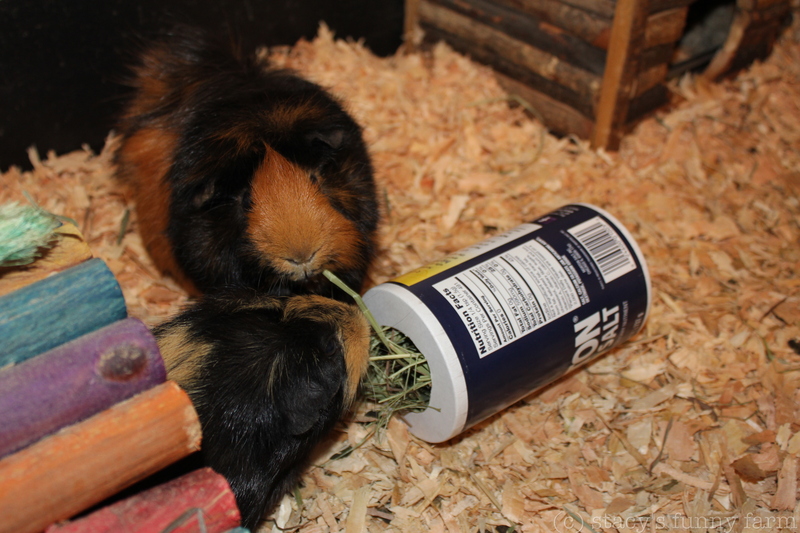 Cute hay dispenser for bored guinea pigs, right? Well, not if the hole is exactly that size. 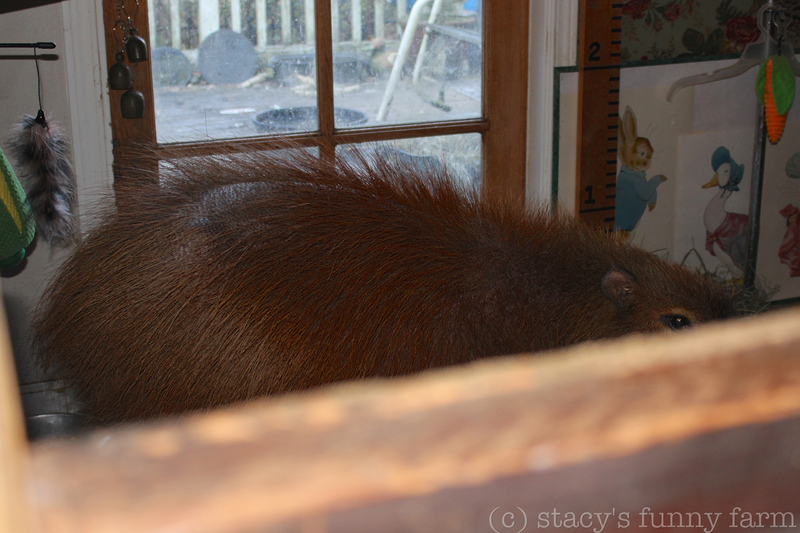 Big enough for a guinea pig to get his head IN, not big enough to get it OUT. Thank you for that demonstration, Fred. Next time, I’ll cut out bigger holes. Sorry about that, Frederick of Hollywood! This was the last night of freezing weather, and Dobby was pretty fed up. It’s easy to say it was an Oops! but he is deliberate and extremely accurate with his masterpieces. I am still puzzling over the message here, though. The Philosopher. What does it all mean?